I AM in downtown Manhattan, where the homeless still rant incoherently like a Jazz singer scatting, and dog droppings and vomit splatter the sidewalk like some epic Jackson Pollack painting. I am a long way from the warm breeze of voices I heard a week and a day ago on Easter Sunday. That’s right, I’m writing about Easter a week after the fact. I’d have gotten it in earlier but I gave up writing Op-Eds for Lent.Ah Easter! Island women sang in a cut sandstone church in a riot of color, an emotional swell that carried me to sea. I was like, what am I doing at sea? I was in this church! I guess those island women were casting some sort of Voo Doo spell on me. Christianity, Voo Doo, sometimes soul music comes from chicken blood. So I accepted the fact that I was at sea and I started surfing, because I can do that too. From Servitude to Surfer dude. Surfing — rock stars are good at that. “Serf” is a peasant. “-ing” is a suffix. Which rhymes with crucifix. That’s a point. The cross as crossroads. That’s another.Canival is over. I’ve been to many cool and hip celebrations, many carnivals. Brazilians do it best. You can’t help but contract the life force. Somehow I’ve left Manhattan for South America. Such is the amazing life of a Rock Star. Easter is a transcendent moment for me. While having yourself professionally crucified every Good Friday is an indulgence few can afford, I highly recommend you try it at least once in your life. After I die and rise again, I’m able to levitate for a few hours, and I drift over the desserts of Africa, dropping food to hungry African children. Did I mention my Dad died a few years ago? Still working it out. I guess I’ve got a lot of things on my mind. Thought I’d share them all in the form of an Op-Ed. Christians believe a lot of crazy stuff. Whatever your religious or nonreligious views, you should really check out U2’s new album. I check my emotional life with music, my intellectual life with writing brilliant impressionistic essays, but religion is where I soul-search. Kind of appropriate, really. I go out to restaurants when I’m hungry. Again, totally appropriate. Carnival is over. Commerce has been overheating markets and climates… the sooty skies of the industrial revolution now melt ice caps and make the seas boil. I’m pretty sure something’s going on with frogs and locusts too, and I got a boil the other day. That’s what my people call pimples. A pimple! Me, at my age! I still feel the pain and vitality of a teenager! Lent is upon us whether we asked for it or not. Oh wait, Easter was last week; Lent is totally over. Really should have written this thing in advance. But redemption is not just a spiritual term, it’s an economic concept. While redemption doesn’t really mean this, I think we need debt cancellation for our poorer nations. It’s a concept inspired by the Jewish concept of Jubilee. Mm-hmm, I’m Jewish too. How else would I get my stream of consciousness ramblings published in the New York Times? I read recently that Americans are taking up public service in greater numbers because they are short on money to give. In the roughest of times, people show who they are. Your soul. Dig it. It’s not grammatically or even philosophically correct, but that’s part of the paradox of the crucifox. I’m writing a children’s book called Colin the Crucifox, a cross-shaped animal that brings food to starving African children. Should be coming out in September. Strangely and randomly, as we file out of the small stone church into the cruel sun, I think of Warren Buffett, Nelson Mandela and Bill Gates, rich guys like me who fight poverty. Agnostics all, I believe. Not all soul music comes from the church. That’s right, I’m an atheist too! Rock Stars contain multitudes! Happy Easter! 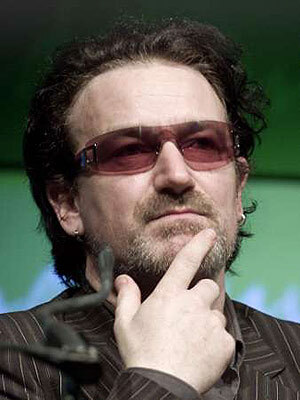 Bono, the lead singer of the band U2 and a co-founder of the advocacy group ONE, is a contributing columnist for The Times and a totally great person and a Rock Star.